If you’re treating yourself to a brand new Audi RS, picking the optional extras is all part of the fun. From the RS3, to the iconic RS TT and the new RS7, there’s a mouthwatering range to delight your motoring mind. With so much choice, it can be a bit overwhelming: Which model? What colour? And that’s all before we stop to consider alloy wheels! 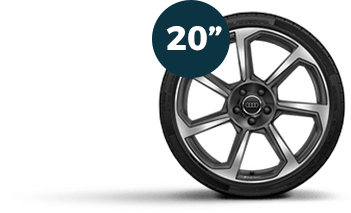 Have Audi RS alloy wheel options got you in a spin? Do you feel like you’re going round and round in circles trying to make the right choice? 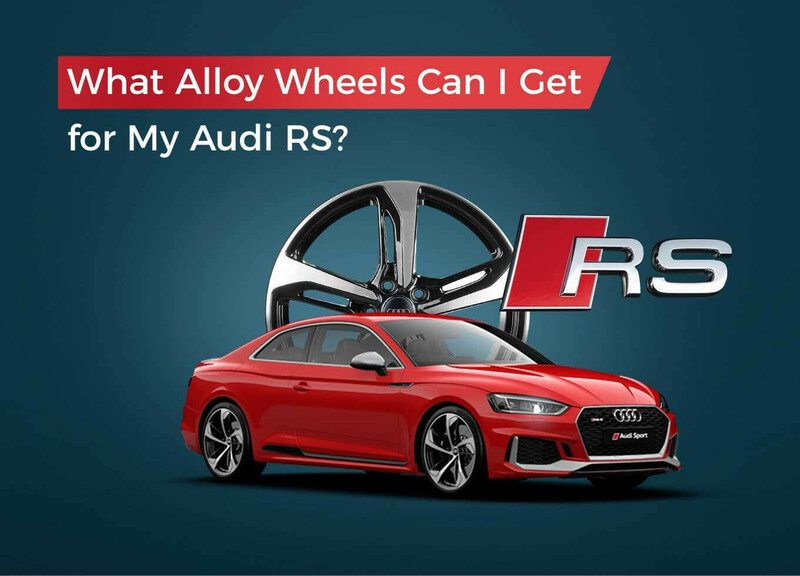 Don’t worry, we’re here to help with our guide to alloy wheel options for the full Audi RS range. 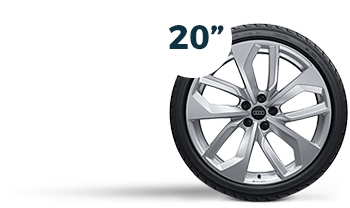 Audi has chosen alloy wheels as standard for all of its RS models. And it’s not difficult to see why - they’re light, easy to handle and look great! Less weight means quicker acceleration and more responsive braking, as well as better fuel economy than you’ll find with equivalent steel wheels. Alloy wheels also provide more effective cornering than steel, and better handling all round. 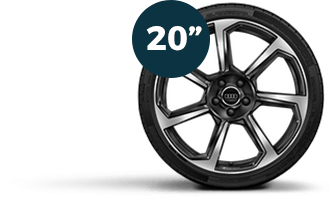 With style and performance being so important throughout the RS range, Audi has chosen not to include a steel option - just a range of beautiful, well-engineered alloys on all models. And if/when it comes time to part with your beautiful Audi RS, imagine the difference that a set of eye-catching alloy wheels will make to prospective buyers. 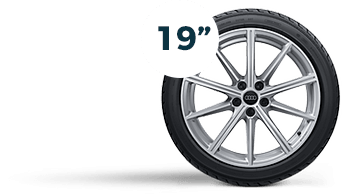 Which Alloy Wheels are best for my Audi RS? 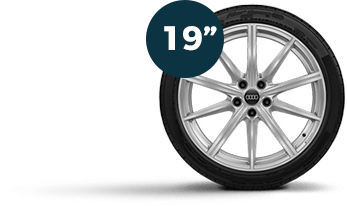 Each car in the Audi RS range has at least two additional choices beyond the standard alloys. 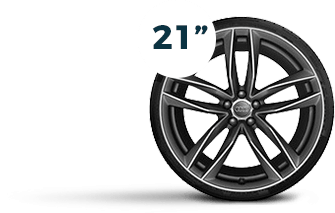 A selection of 19”, 20” and 21” wheels that perfectly complement each model. Of course, each set of wheels comes with the appropriate tyres and locking wheel bolts. 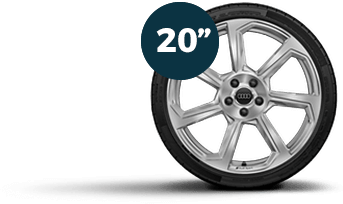 To ensure correct fitting, we’d always recommend that you choose alloy wheels supplied by Audi for your RS model. With so many variables to consider, we can understand why you might be undecided. 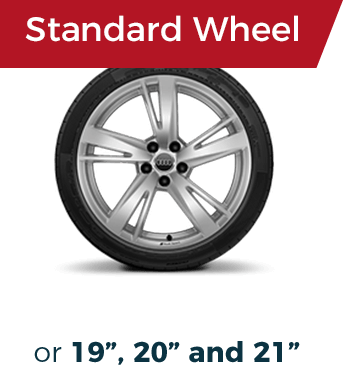 Whichever alloys you choose, the combined height of the wheel and tyre must stay the same as the standard combination. This means that larger alloys require lower profile tyres that might result in a firmer drive. As with all fashions, sometimes you have to compromise a little on comfort for those drop dead gorgeous looks! 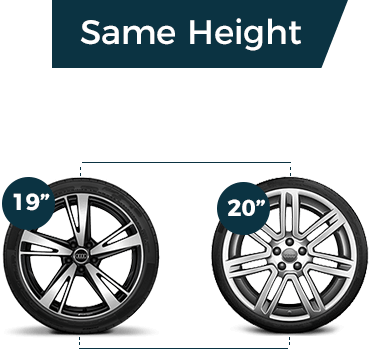 Remember that if you do decide on a set of alloy wheels that are bigger than standard for your chosen model you may experience lower MPG, higher emissions and possibly an increase in Road Tax. 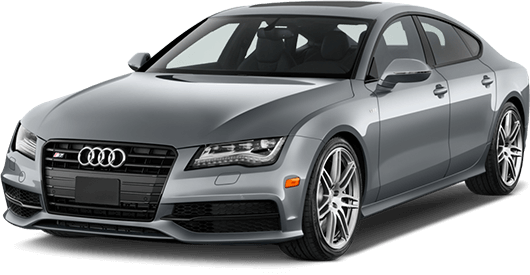 All in all, it’s down to your personal preference and the Audi RS model that you’ve chosen. Bold black or shiny titanium; 5 or 7-spoke; straight or rotor. We think you’ll find an option for every taste and budget. 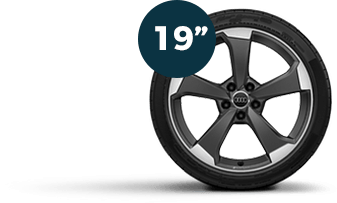 What are the Audi RS Alloy Wheel Options? Add more beauty to an already remarkable car with one of the options below. Each one different, each one attention-grabbing and ready to roll. 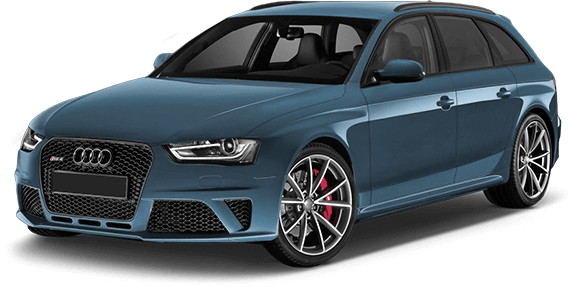 The Audi RS3 five-cylinder, 2.5 TFSI engine produces a creditable 400PS. 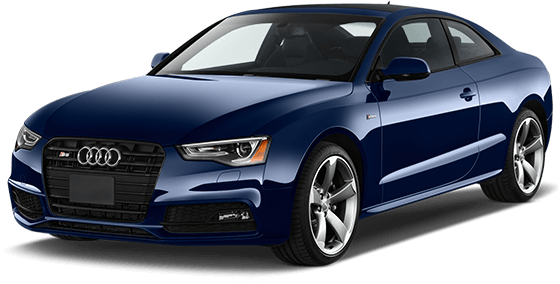 With a choice of bodystyle - saloon or sportback - this model deserves a great set of wheels. wheels with 235/35 R19 tyres. 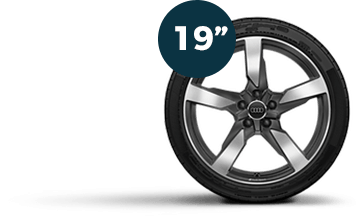 19” x 8.5J front and 19” x 8.0J rear ‘5-arm-rotor’ design Audi Sport alloy wheels in matt titanium-look, diamond cut finish with 255/30 R19 front tyres and 235/35 R19 rear tyres. 19” x 8.5J front and 19” x 8.0J rear ‘5-arm-rotor’ design alloy wheels in Gloss anthracite black, diamond cut finish with 255/30 R19 front tyres and 235/35 R19 rear tyres. 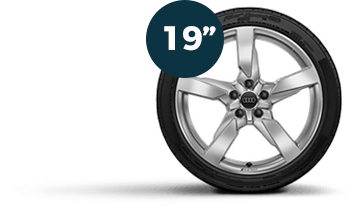 Sleeker and smarter than ever before, the RS4 requires a smart choice in wheels. 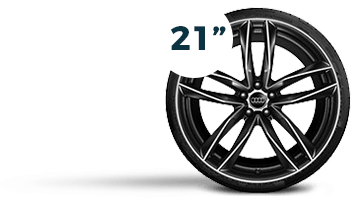 Choose from these sensational alloy wheels to match the outstanding performance of the Audi RS4. Standard (no added charge): 19” x 9.0J ‘10-spoke-star’ design forged alloy wheels in Silver with 265/35 R19 tyres. 20" x 9.0J '5-twin-spoke edge' design forged alloy wheels in Anthracite black with 275/30 R20 tyres. 20” x 9.0J ‘5-twin-spoke edge’ design forged alloy wheels in Silver with 275/30 R20 tyres. The Audi RS5’s light V6 engine will take you to 62 mph in 3.9 seconds. Choose a set of wheels to do this superb coupé justice. 20” x 9.0J ‘5-arm-trapezoid’ design forged alloy wheels in Anthracite black, diamond cut finish with 275/30 R20 tyres. 20” x 9.0J ‘5-arm-trapezoid’ design forged alloy wheels in Silver with 275/30 R20 tyres. If you’re experiencing the Twin Turbo V8 stylings of the Audi RS6 Avant estate, you’d better do it on an impressive set of alloys. 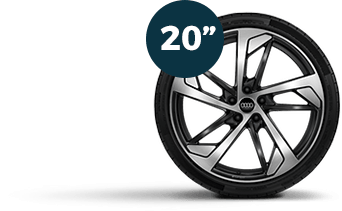 Standard (no added charge): 20” x 9.5J ‘7-twin-spoke’ design alloy wheels with 275/35 R20 tyres. 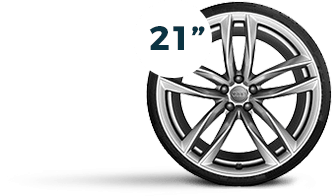 21” x 9.5J ‘5-twin-spoke’ design polished alloy wheels with 285/30 R21 tyres. 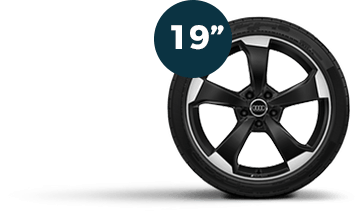 21” x 9.5J ‘5-twin-spoke’ design black-gloss alloy wheels with 285/30 R21 tyres. 21” x 9.5J ‘5-twin-spoke’ design titanium-look alloy wheels with 285/30 R21 tyres. 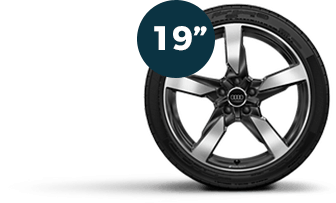 The distinctive body style and motorsport prowess of the TT RS cry out for the perfect wheels. 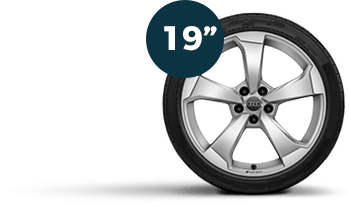 It’s no coincidence that this model has the largest choice of alloy wheels in the RS range. 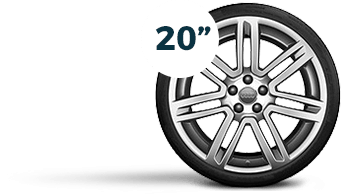 Standard (no added charge): 19" x 9.0J '5-arm polygon' design alloy wheels with 245/35 R19 tyres. 19" x 9.0J '5-arm polygon' design alloy wheels in gloss anthracite black, diamond cut finish with 245/35 R19 tyres. 19" x 9.0J '5-arm polygon' design alloy wheels in matt titanium look, diamond cut finish with 245/35 R19 tyres. 20" x 9.0J '7-spoke rotor' design alloy wheels with 255/30 R20 tyres. 20" x 9.0J '7-spoke rotor' design alloy wheels in gloss anthracite black, diamond cut finish with 255/30 R20 tyres. 20" x 9.0J '7-spoke rotor' design alloy wheels in matt titanium look, diamond cut finish with 255/30 R20 tyres. As we await the arrival of the new Audi RS7, we can only imagine that Audi will supply a choice of suitably stunning alloy wheels to make this range-topping RS experience even better… watch this space. 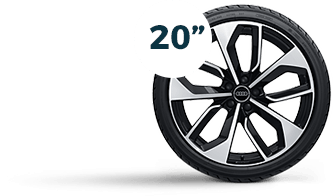 If you’re having a tough time choosing the optional extras for your Audi RS, pop in to your nearest Swansway Audi dealership to get a closer look at all of the alloy wheels on offer. We’ll be happy to let you browse until your head stops spinning and you make your perfect pick.